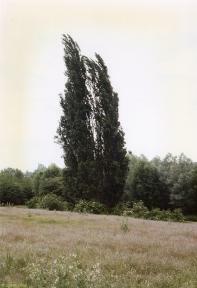 One of three surviving trees from a line of poplars planted along the Meridian on the Easnye estate in 1903. The trees are the oldest known marking of the Meridian for non-astronomical purposes. What prompted their planting or how the exact location of the line was determined remains a mystery. The estate map – a hand annotated copy of the OS 1:2,500 edition published in 1898 – shows the line of trees and their date of planting, but not their individual positions. The map as originally published however gives no clues as to where the Meridian runs.